What Is The Green Earth Harvest CSA? Learn about the 60-acre property that The Conservation Foundation calls home. 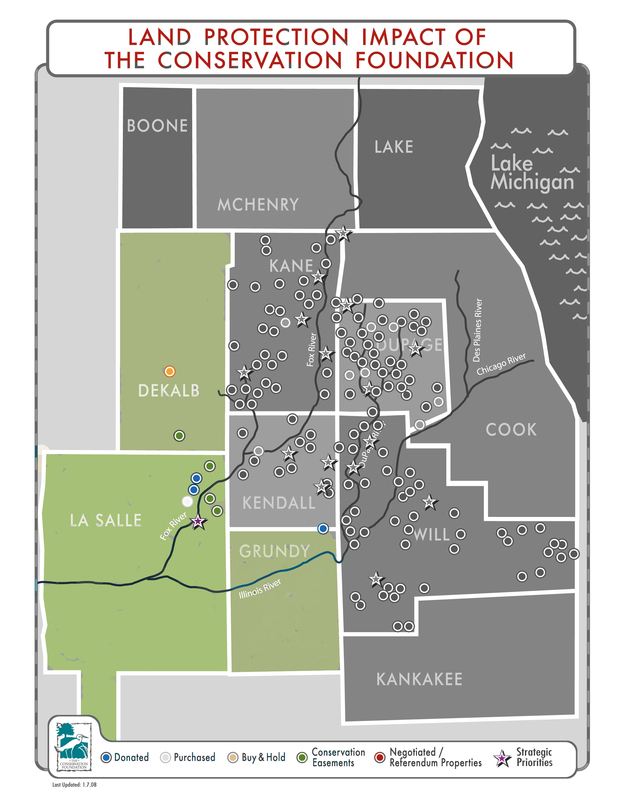 In addition to our four-county core serve area of DuPage, Kane, Kendall and Will Counties, TCF also helps folks in La Salle, Grundy and De Kalb Counties. Our main focus in La Salle County is the Lower Fox River watershed. We have focused on preserving key high quality natural areas in the Lower Fox and La Salle County, in addition to Kendall County, has its fair share of spectacular places. Among these is the 253-acre Dayton Bluffs, which we purchased in 2013. Our continued focus in the near future will be on preserving other lands along the Lower Fox River in accordance with our Lower Fox River Strategic Land Conservation Plan. Our Fox River Initiative has also begun in this area to help citizens become more aware of and enjoy the Fox River in the hopes that they will then feel inspired to protect and improve it. Click here to learn more about the Fox River Initiative. Our involvement thus far in De Kalb County is assisting the De Kalb County Forest Preserve District acquire land for more forest preserves. Since, 2006, we have helped De Kalb County pass an open space referendum and acquire three properties totaling more than 250 acres. In addition, we hold a conservation easement on 35 acres of high quality wetland and prairie near Leland. The Big Rock Creek watershed is an important stream to us and part of its headwaters are located in De Kalb County. Grundy County has been less active for us but there is great opportunity here. TCF has been very active in the lower half of the Aux Sable Creek watershed. Although its origins and most of the watershed is located in Kendall County, the Aux Sable Creek is a high quality stream system and we don’t ignore it when it crosses into Grundy County. In fact, we partnered with the City of Minooka in helping to preserve a 10-acre parcel along the creek as part of a planned greenway. TCF’s involvement in other Northeast Illinois counties is limited to partnering, mentoring and providing value added services to other land conservation organizations located there. We partner with and assist similar organizations such as Conserve Lake County, Land Conservancy of McHenry County, and the Barrington Area Conservation Trust in Northwest Cook County.